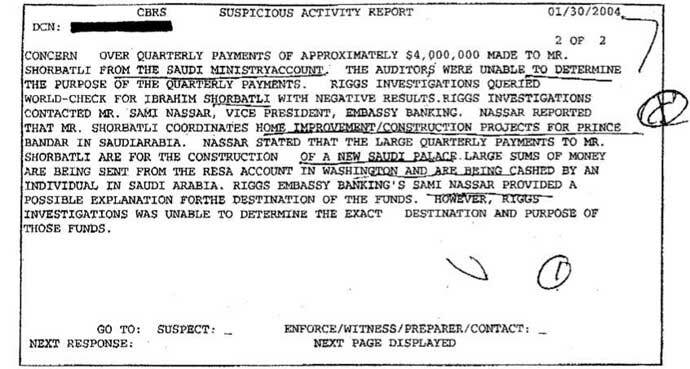 The Suspicious Activity Report below reveals what appears to be a personal use of funds from the Al Yamamah arms deal by Prince Bandar bin Sultan. It shows payments totaling $17 million to an architect in Saudi Arabia for work on one of the prince's palaces. The funds were sent from one of the Saudi Embassy's Riggs Bank accounts into which $2 billion in Al Yamamah funds were paid. One reason banks are required to file Suspicious Activity Reports (SARs) is when they suspect funds come from or disguise illegal activity. The Treasury, which receives the reports, calls SARs "one of the government's main weapons in the battle against money laundering." This SAR, and others involving the Saudi Embassy accounts, were leaked to the press. The resulting stories in Newsweek and The Washington Post gave a rare inside view of the spending habits and accounting practices of the Saudi royal family. The SARs also proved interesting to the FBI, who had been investigating Saudi finances since 9/11 for any link to Al Qaeda and other terrorist organizations. Dennis Lormel, who supervised the investigation of the Saudi Embassy accounts, says the FBI found no connection to terrorism in these accounts, but did see suspicious movements of large amounts of cash: "It seemed like activities that I would see in money laundering or other types of investigations," he told FRONTLINE. "If you look at the dispersements in those accounts, [the] $17 million for his 'residence' was not his residence. It's a government-owned property in the Kingdom of Saudi Arabia which they make available to senior members of the Royal Family to live [in]. "These [accounts] were regularly audited by the [Saudi] Ministry of Finance, and found to be totally proper."